TERELJ N.P., JUNE 2002 - We arrived in the early afternoon in Ulan Bator (UB) with a Mongolian train, coming from Beijing. We had travelled for a full day and night, with an almost endless stop on the Mongolian border in between... We were tired, after having seen so many desert, steppes, horses, camels, ... and swallowing so much dirt. But we were very excited to see this city from the distance. The most striking part to me are the 'suburbs' which are a mixture of traditional nomad yurts (called 'gers' in Mongolian) and basic wooden houses, sometimes not much bigger than sheds. The next day, we left the hotel early to go into the Mongolian countrysite with the bus. 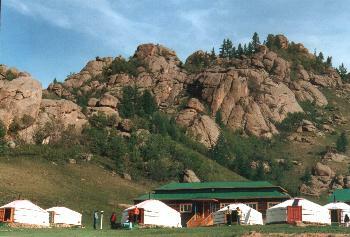 Our destination of today was to visit some Mongolian nomad settlements, and to go to the Terelj National Park, where we would sleep in ger tents ourselves ! Everybody was pretty excited about this idea. The first thing on the way were the 'suburbs' we had already seen from the train, in close-up this time. These appeared to me really unbelievable and so different. 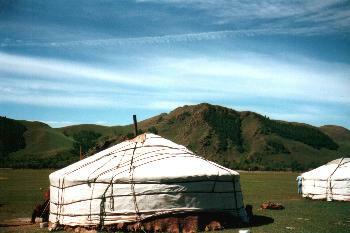 Mongolian people just prefer to live in a ger, and the sheds are mostly only used in winter (by the way, temperature difference between mid-summer and mid-winter is 70 degrees Celsius !). Also in the suburbs , horses are a normal way to travel, and on rare occations some use them even to go 'into town'. But these days, also a lot of old (Russian) cars around. The dust in these places , like on the infamous 'black market' I visited, is covering everything ! 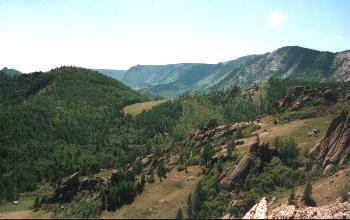 The countryside was soon becoming desolate, and the dust dissapeared, and nice green hilly landscapes were unfolding. Almost no other traffic on these roads, only nomad settlements and horses and herds besides the road. We stopped to meet some men reparing their truck - standing in the middle of the road, but if it is broken, what can you do ? The pieces of the engine were on display before the truck, and someone was hammering on some pieces... These men were friendly guys and they asked us ourselves to have their picture taken, as if they were proud of their repair work that was now lying in the middle of the road. Later we stopped to visit a nomad family. This campment consisted of two ger tents, and some herds of sheep & goats, some horses, and two very big dogs - which were to my relief very friendly and did ignore us all together... Our Mongolian guide asked the 'chief' (the oldest man) if we could visit them and enter the ger. 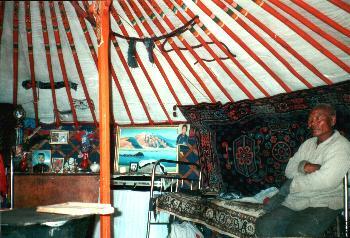 The inside of the ger was very nicely decorated, with a family altar and several carpets. Our guide translated some of our questions. We learned that this 'man of the family' was the 70 year old son of the woman sitting in front of the ger (she was believed to be 'almost 100 years', but her actual age is not precisely known) . Mongolian people are rather superstitious, and we had read about not turning your back to the altar or elderly people, always move in clockwise direction inside and (obviously ? ) not leaning on a supporting post. The man explained us they could set up the tent in about 15 minutes, and that the outside consisted of three layers of felt during winter.